I realize the general demographic of the MH audience, but some of you might be old enough to remember a seven-game stretch of baseball known as the 1960 World Series. The games the Pirates won were all relatively close, with finals of 6-4, 3-2, 5-2, and 10-9. The games the Yankees won were decidedly not close: 16-3, 10-0, and 12-0. It was a strange dynamic, and eventually took every last at-bat to decide the series, but things worked in our favor. One can't help but think of the '60 Bucs series when looking at the early results of the 2010 model, a team that's given up 43 runs in their first four losses while winning games in more dramatic fashion, including a walk-off 4-3 win over Los Angeles last week and a two run ninth-inning to topple the Giants, 6-5, late last night in San Fran. Aki Iwamura, who homered earlier in the contest, singled to center, scoring Ryan Church for what would be the go ahead run last night in a Pirate ninth that also saw Andy LaRoche go deep. Evan Meek pitched two scoreless innings for the win and Octavio Dotel did his best to make it exciting, surrendering a two-run dinger to Eugenio Valdez in the ninth before closing things out for save #2. 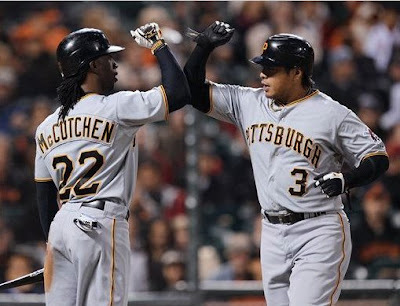 Garrett Jones had three hits, two RBI, and the game-ending catch of a scorching line drive to win it for Pittsburgh. The two teams close things out at 3:45 today, with Charlie Morton and his 21.60 ERA taking on Jonathan Sanchez and his 6.23 ERA. Judging by recent (and 50-year-old) history, it's either going to be a shootout or a blowout, since we got the requisite win out of the way last night. i'm amazed every time they win! how do they do it? I think other teams sometimes just give up when it's close, so they can get the hell out of there. They don't want whatver losers disease they have rubbing off on them. Looks like it's the rout option today. Look at the bright side...at this pace, we'll win the World Series right?